Kodi Popcorn Time Addon: Should you use it? What are the alternatives? Kodi Popcorn Time addon: Should you use Popcorn Time on Kodi? Are you interested in the Popcorn Time Kodi addon? In this article we’ll be exploring Popcorn Time’s content library, functionality, and legitimacy to find out if it’s right for you. Kodi is open source media center software that has become incredibly popular thanks to its cross-platform potential. It can be easily installed on almost any popular device including Apple TV, Roku, and even USB pen drives. Better still, there’s minimal functional disparity between platforms. If an addon or feature works on a desktop PC, it’ll likely work on mobile devices too. 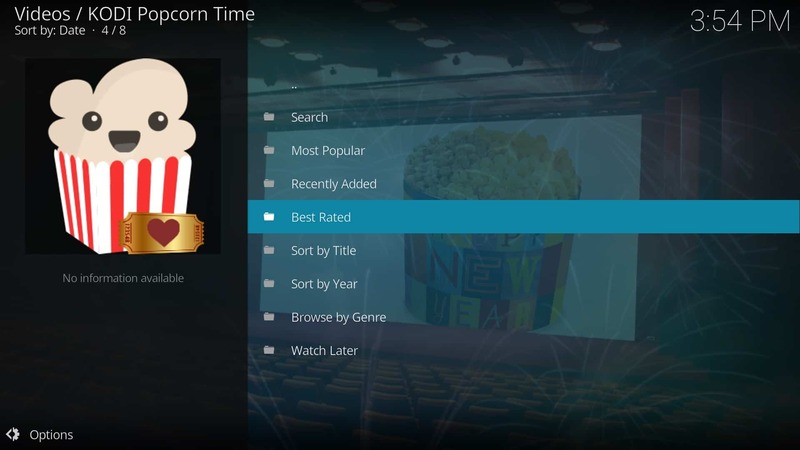 This article will examine the Kodi Popcorn Time addon. 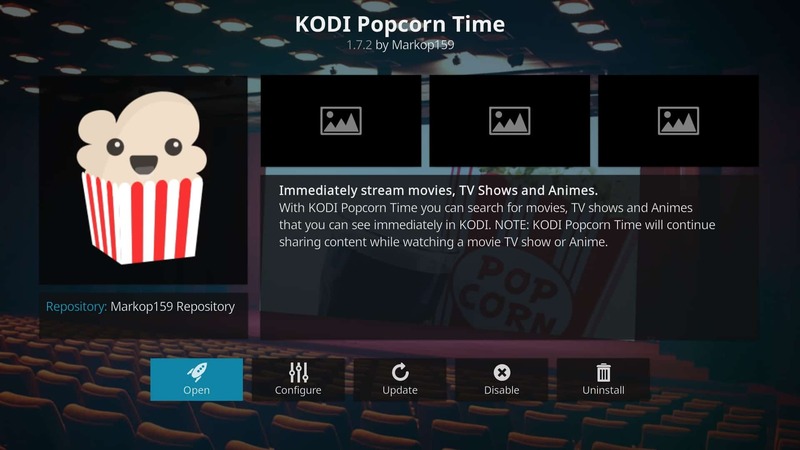 We’ll evaluate its menu structure, configuration options, sources, and ease of use to determine if Popcorn Time is suitable for the majority of Kodi users to install. Kodi is completely legal to use but has attracted negative coverage due to unofficial addons that provide access to unlicensed content. We strongly encourage our readers to use only official sources of content and to research the laws in their country before using Kodi to stream. This article highlights some of the possible risks that can come with using some Kodi addons. Most third-party Kodi addon developers are well intentioned and spend their own time and resources to build great addons for the Kodi community. Nevertheless, even some of the most popular third-party addons have been misused by rogue developers in the past. It is worth being aware of these risks if you are considering installing any addon. 1.0.1 READER DEAL: save 60% on an IPVanish plan here. 2 What is the Popcorn Time addon? Virtual private networks (VPNs) are sometimes used by people looking to hide unlicensed streaming from their internet service provider (ISP) and are popular with Kodi and torrent users. That said, there are many ways a VPN can benefit people that only stream legally. A VPN encrypts your network traffic and prevents any third party from seeing your activities. This includes not just hackers, but also your ISP, who may seek to sell your browsing history or use it to justify throttling your network speeds. To protect yourself, you need to find a VPN provider that can be trusted. That isn’t as simple as it seems, however. Some VPNs keep detailed logs of your online activities, others have used their customer’s bandwidth to create botnets, and some just slow your connection until it’s almost unusable. We recommend IPVanish. It offers fast and stable connections to servers in more than 50 countries. Further, it’s one of the easiest VPNs to install on multiple platforms, with dedicated Android, iOS, and Amazon Fire TV apps. READER DEAL: save 60% on an IPVanish plan here. What is the Popcorn Time addon? Popcorn Time is an addon that allows the user to find and download torrents from peer-to-peer (P2P) networks. This means that as you download a file, you’ll also be allowing other users to download the parts that you have. As a result, when you use a P2P addon, you’re allowing external computers to access your system, which compounds the risk that comes with installing any Kodi addon. While torrenting isn’t inherently illegal, it has become one of the most popular ways to share unlicensed content. A cursory glance at Popcorn Time’s “Most Popular” section shows numerous movies that haven’t been released on home media yet. This is a telltale sign that the addon doesn’t cater to users looking for properly licensed content. If that isn’t enough evidence, the number of lawsuits filed against Popcorn Time and its users should prove this beyond all doubt. Popcorn Time has a fairly in-depth set of torrent configuration options but there’s no way to see the sources it uses to find torrents. Also, we searched for several public domain titles (1968’s Night of the Living Dead, 1960’s Little Shop of Horrors, 1963’s Dementia 13) to see if there was a case for using Popcorn Time legitimately. However, none of the films were found. For the reasons above, we do not recommend Kodi users install the Popcorn Time addon or use it for streaming. Popcorn Time offers a large selection of recently released movies but does not use official sources and comes with significant risk to your system. However, there are many official Kodi addons that offer higher quality content and are completely legitimate. Tubi TV is a streaming platform that offers more than 50,000 TV shows and movies. In fact, it claims to have the largest content library of any streaming service except for Netflix. Unlike Netflix, however, Tubi TV is free to use. The Kodi addon blocks the ads that are shown in the web player or phone app, so there is nothing to stop you watching your favorite titles whenever you want. One of the best things about this addon is that it has minimal region locking in place. Certain titles may not be available in your country but the majority are. Also, if there’s a title you really want to watch you can always just connect your VPN to an American server. Tubi TV is very simple and easy to use. There are no configuration options so what you see is what you get. Content is divided up into one of 24 different genres and all results are displayed on a single page. This allows you to use Kodi’s built-in search and sort tools to quickly see if a particular title is available or not. 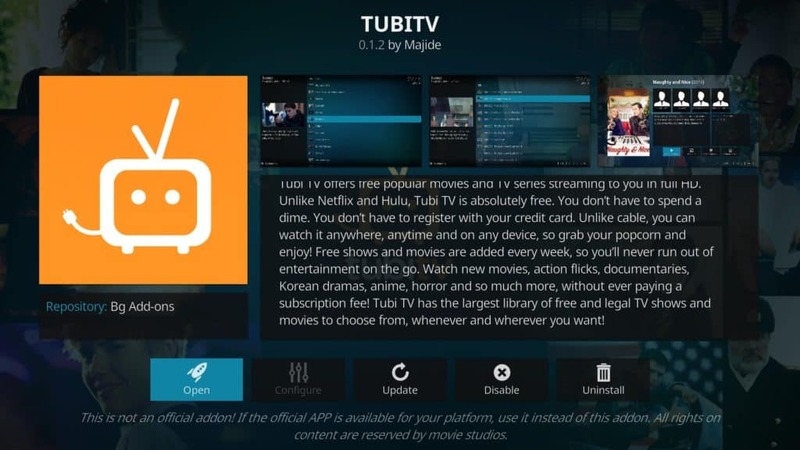 The Tubi TV Kodi addon can be found in the BG repository. Looking for a simpler solution? The following addons also offer expansive libraries of high-quality movies and TV shows. The PlayOn Browser is different from most other Kodi streaming addons in that it doesn’t actually provide any content of its own. Instead, PlayOn Browser allows the user to connect accounts of various streaming platforms. You can then watch all the available content in one place. This is particularly useful for two reasons. First, there’s no official Netflix, Amazon Prime Video or Hulu addon for Kodi 17 or below. That makes PlayOn Browser the easiest and safest way to access their content. Second, it removes the need to keep track of which addons have a specific title. There is a free version of PlayOn available but it restricts access to all but a handful of free to watch sources. By paying $2.50 a month, the user unlocks all 50 sources as well as DVR functionality and the ability to skip ads. Because PlayOn now works with DIRECTV NOW, you can even record live TV streams for later playback. 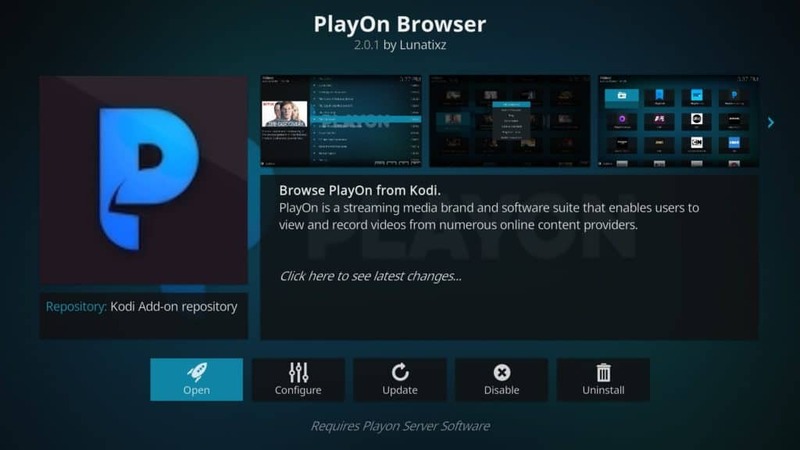 The PlayOn Browser can be found in the official Kodi addon repository. 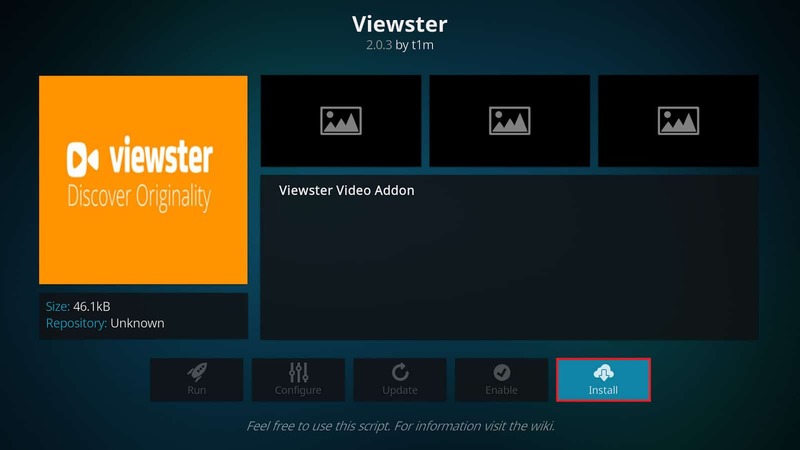 The Viewster addon has a large library of classic movies and one of the widest selections of free and legally accessible anime available. There are cult classics like School Days but also full seasons of recently released shows like No Game No Life and Flip Flappers. While the Crunchyroll addon offers more choice, Viewster doesn’t require registration, is free to use, and can be viewed from anywhere in the world. Also, unlike many unofficial anime addons, Viewster’s content is properly licensed, with the majority available in HD. Although this addon has a search function, it doesn’t actually work. That said, it’s easy to find a specific title. Content is grouped by genre and subdivided based on whether it’s a movie or TV show. There are some very slight organizational issues (duplicate genres, folders with ambiguous names). These do not impact the usability of the addon itself, however, and can be easily overlooked. The Viewster addon can be found in the official Kodi addon repository. PopcornFlix is a Kodi addon that offers TV shows and movies, both new and old. These are separated by genre, however there’s no search function and no way to view only TV shows. Instead, the user has to search through a given category to see if the title they want is available. There are very few official Kodi addons that cater to Spanish speakers and PopcornFlix is one of the best. There’s an entire folder containing movies with hardcoded Spanish subtitles. This removes the need to manually set up subtitles and makes it easy to watch movies even if you aren’t particularly tech literate. It should be noted that PopcornFlix is only available in the US and Canada. Users in other locations can still browse available titles. Nevertheless, you will have to connect via VPN to a North American server before you can actually watch anything. 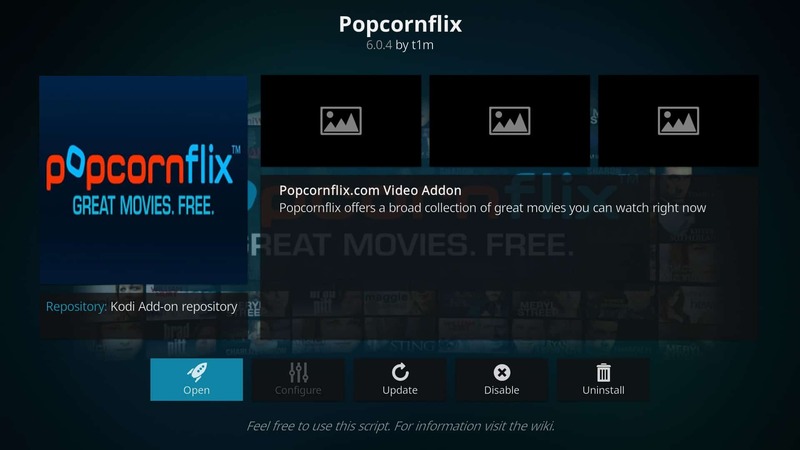 The PopcornFlix addon can be found in the official Kodi addon repository. 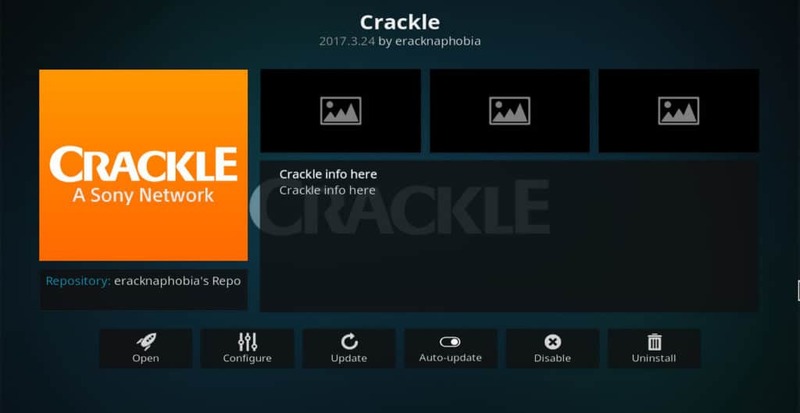 Crackle is a very basic Kodi addon for finding movies and TV shows. Each content type has a single folder and there’s no search function. However, as with Tubi TV, all results are shown on one page. This makes it easy to search for a specific title or to sort the results alphabetically. While some addons focus on quantity over quality, Crackle offers a smaller selection of well-known titles such as Beetlejuice, Heroes, and The Shining. Most of these are fairly old but there are also TV shows from as recently as 2015. Considering Crackle is free to use and doesn’t require registration, the lack of new releases is understandable. This addon has just three changeable settings. The first allows you to change the aspect ratio. You can us it to avoid stretching old movies to modern widescreens. The second enables audio commentary on titles that support it, and the third is used for deauthorizing the current device. Most people will likely be interested in the more recent titles, however, and can safely ignore the options menu entirely. The Crackle addon can be found in the eracknophobia repository. Popcorn Time offers nothing to Kodi users looking for properly licensed content. However, the addons above prove that there are better, safer options available. In fact, there’s an addon to fit almost any taste, whether you’re looking to watch movies, kid’s cartoons, live TV, or even the Super Bowl. That said, finding an addon you like is just the beginning. We can help you install a VPN to stay protected while you watch, automatically keep track of your media consumption, and resolve any issues you might be having with Kodi. Kodi presents a world of possibilities so why not use it to its full potential?